My first step was to stop wasting energy fighting the roots. Why dig them out every year when I could devote that space to a native perennial shade garden? This fall I did just that. I worked the soil under the tree and put in plants which are native to this area, including Jack in the Pulpit, Solomon’s Seal, Great Blue Lobelia, Wild Stonecrop, and Common Bluestar. These perennials establish roots that allow the plants to come back year after year, shutting out weeds as they grow. This eliminates the need to dig, and builds a population of plants that are well adjusted to the Virginia Coastal Plain in the Eastern United States where I live. – Lesson One: Accept “What Is.” The shade garden only takes up 12% of my garden, and while it will not directly produce edibles like zucchini and beans, it will improve the productivity of the garden in essential, low-maintenance, nearly invisible ways. The plants will attract bees and birds which will pollinate other plants in my garden, improving productivity. This is a lesson in diversity: we need participants in our organizations who are good at contributing in diverse ways, and they may need different conditions and support to flourish. My second step was to learn about the tree, and thus my googling spree to find leaves that were serrulate, acute, acuminate, pinnate, alternate, elliptical, and simple, with an indehiscent (or non-self-opening) fruit. It appears to be a Black (Wild) Cherry Tree, or Prunus serotina, which (happily) is native to the Eastern United States. – Lesson Two: Collaborate with “What Is.” For three years I missed many opportunities to understand the tree. I failed to pay attention in the spring when it flowered, or to mark what color the leaves turned in the fall. I did not research the fruits, which I could have been harvesting every year. And I dug into its roots, damaging the tree, because of my focus on producing vegetables that didn’t really belong beneath a tree. Now I am paying attention and adjusting my attitude: I now see the tree as a unique and benevolent feature of my garden. In the spring when it flowers, I hope to confirm it is a Prunus serotina. My third step will be to create a sun map, which marks out where the sun and shade fall at different times of the day and as the seasons change. My garden will have more rounded contours following the path of the shade and sun. I will also plant more native perennials to increase productivity and decrease labor. – Lesson Three: Look for the System that Is Waiting to Help. There is a natural flow to this piece of land, even though it is just a postage stamp in the larger ecosystem. There are dynamics between earth and sky, soil and creatures, which I can tap into to support my goals. This is true in organizations as well. This doesn’t mean we will never fight for (or against) something; in fact, there may be a system waiting for us to harness its power to support our fight. What are the forgotten features and neglected assets that your system is offering to support your organization’s mission and purpose? What is the “tree” you love which annoys you, hanging over your organization? By opening to “what is,” I am asking the question, what does the garden want to be? Sure, I want non-native plants such as beefsteak tomatoes. But why fight what comes naturally to the garden? Instead I can blend what is natural and organic to this land and space with my beefsteak ambitions as a gardener. What analogies do you see between my re-imagining in the garden and what is possible in organizational life? How can we accept and benefit from “what is” (and what is difficult) where we lead and work? – Harnessing Passion. A “problematic” employee may have so much passion to protect the organization that she comes across as stubbornly resistant to change. If we notice her deep caring is something to be harnessed, there may be ways to understand and guide the passion to constructive ends. The manager who resists change may be responsible for the sterling financial reputation of the organization. How can that person help safeguard financial accountability while allowing the experimentation required for adaptability and resilience? The key is to find out what is underneath “problematic” behavior – there may be a powerful asset there. President Obama, for example, names the powerful asset (deep love of country) and helps us see beyond the difficult surface manifestation (battling fiercely). – Harnessing Cleverness. Organizational members may be strategic and clever in coping with stress in the organization, yet the coping styles may not always be appropriate to a given situation. Supporting employees in learning to identify and understand their own coping styles can help everyone relax and see their behavior more clearly – and see other options which may be more appropriate. By honoring members’ cleverness and also exploring alternatives, members can grow and the organizational community can be more functional. – Harnessing Commitment. A leader might appear to have tunnel vision. He is committed to assertive entrepreneurship while letting the organizational infrastructure develop catch-as-catch-can. Others can see the over-focus is undermining the organization’s effectiveness. Employees and board members feel there is too much risk-taking and not enough stability, which dampens their enthusiasm and increases turnover. By honoring each person’s commitment to a certain value and learning together how to balance seemingly opposite values (e.g., risk-taking and stability), everyone can balance their commitment across a spectrum of values. We acknowledge that a range of values is needed, and each supports the other. While not everything can be re-imagined in this way, and sometimes tough choices have to be made, learning to find the nugget of gold in most any behavior helps our organizations become healthier, more self-managing, and more resilient. What was once viewed as dangerous or wasteful for the organization can reveal its underlying value and channel its power toward constructive ends. What we ignore or disdain might even be a golden goose. Opening Creativity works primarily with nonprofit leaders and organizations to support the kinds of learning and transformation described above to discover hidden treasure and reach the highest potential. Contact us to discuss your situation! 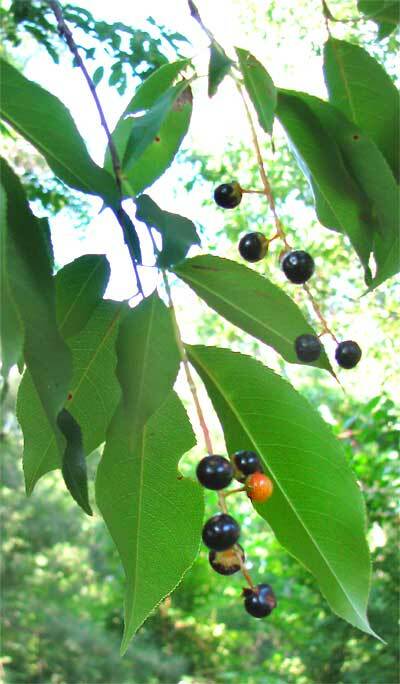 Black (Wild) Cherries, I have learned, can be used in jams, pies, liqueurs and wines, and to flavor drinks and ice cream. The tree’s springtime flowers attract and feed birds and bees which fertilize and pollinate the garden, bringing “free” and essential benefits. Pending definitive identification of this tree as a Black Cherry, these fruits may have been growing freely at my fingertips for three years while I remained blind to their value. My attitude toward the tree has shifted 180 degrees, and I now see it as a generous, natural, and beneficial friend in the garden. Please comment using the link below, and share your stories of discovering that something you did not understand or found irritating was actually something valuable – or even became a golden goose for your life or organization. Or how you can discover hidden treasure in political life. Thanks for sending a link to your article! I love the concreteness of your examples and even more so the idea of looking for systems that are waiting to help. Dear Kristen: Thank you for this beautifully written article on a subject of such import and value. It reminds me of a recent experience I had at work. Several months ago, I found myself at loggerheads with a co-worker who discovered that I was working with an outdated contractual document and then chose to bring this to light in a very personal and confrontational manner. In addition, I was accused of circumventing company policy, when in fact I was operating under a longstanding policy exception. In point of fact, the exception was one that I myself had questioned several times in the past – including in past discussions long-forgotten by my accuser, who had told me there was no need to review or change said policy. I found myself becoming extremely defensive due to the aggressive and accusational nature of my co-worker’s tone, and I knew I needed to step back and reevaluate the problem at hand. First, I identified the problem: my accuser was responding to two specific issues: 1) my use of outdated contract documents and 2) my use of a procedure that did not align with standard corporate policy. By refocusing my attention on the issues rather than the manner in which they were raise, I quickly saw that we shared a concern for the company’s best interests. I stopped defending my actions and responded to my colleague’s legitimate concerns. First, I worked to ensure that all our documentation was brought up to date as quickly as possible, and instituted measures to ensure that our documentation would remain current moving forward. Then, I worked to define and review the policy exception in question, and to ensure that all concerned parties were given the opportunity to weigh in. I wish I could say that my professional relationship with this colleague evolved to a point of mutual cooperation and respect, but that did not happen. However, the confrontation itself vanished as soon as my approach shifted, and valuable and necessary discussions are being had as a result of my colleague’s vigilance: a far step above where we started.